Focus: Liberals believe that a tax cut for the rich is stealing from the poor. So when will rich liberals, who are thieves in their own minds, going to pay back the Reagan, Contract With America, and Bush tax cuts? Details: #9 Liberals Are the Compassionate Ones – Really? answers the question in the title with a multitude of evidence. Liberals are not really compassionate. They are populists. A populist is a political manipulator who uses the us-versus-them strategy to ingratiate themselves to one group of people by demonizing another group of people. Thus, we have liberals pitting the poor against the rich to gain popularity with the masses by pretending to be compassionate for their cause by attacking the ‘evil rich’. Of course, usually it all boils down to penalizing the rich with more taxes and regulations, while little changes for the poor. This, liberals define as compassion. Liberals or conservatives? Who gives more money to charities? Who gives more money to elite charities like operas, art galleries, etc.? Who gives more money to charities for the needy? Who donates more blood? Who donates more time as volunteers? Who is more likely to keep excess change? Who is more likely to help a homeless person? Who buys “green” and then are more likely to smugly lie, cheat and steal? Who prefers to be generous with other people’s money? Once all of these questions are answered we will know if liberals really are the compassionate ones. Try this Google search: >tax cuts*rich*immoral< (include the * between the words – it is a proximity limiter). It returned a staggering 5 million results! Or try >tax cuts*rich*obscene< – it returned another 1.8 million results! Or >tax cuts*rich*theft< – 5.6 million more results! Or >tax cuts*rich*crime< – another 13 million results! Or try >tax cuts*rich*extortion< – 4.6 million results! Or >tax cuts*rich*robbing< – 5.6 million results. Or better yet, try >tax cuts*rich*corrupt< – and another 13 million results! The point of all this is that liberals universally view tax cuts for the rich as immoral, obscene, corrupt, robbery, extortion and theft from the poor to give to the rich (this is very deep-seated paranoia). Here is the bottom line, American neighbor: From a liberal point of view tax cuts must be seen as stolen from the poor to justify a demonizing of the ‘evil rich’ who supposedly disproportionately benefit from them. If tax cuts are viewed as a retaining of legitimate earnings by the legitimate earner (as they actually are), the rationalization for liberal demagoguery all but vanishes. In other words, there is no legitimacy to the class warfare argument of President Obama, the Occupy movement, and liberals in general, unless the supposed “excess” money of the rich is viewed as coercively taken from the poor. Theft is the only rationalization that liberals can use to claim a supposedly legitimate right to taking the money back with wildly out-of-proportion progressive taxes. Without this point of view there is nothing “unfair” about the rich being rich – the flat tax where everyone is taxed at exactly the same rate would be what is fair (and actually is). Without this “theft” point of view, it is actually liberals who are unfairly desiring to coercively take money from the rich that liberals have no legitimate claim on. The next Occupy Wall Street myth we will deal with is their assertion that the rich don’t pay their fair share of taxes and that tax cuts place more burden of paid taxes on the poor and less on the rich. So let’s look at the shares of income taxes paid by the rich compared to the rest of taxpayers after the Reagan, Contract With America and Bush tax rate cuts. 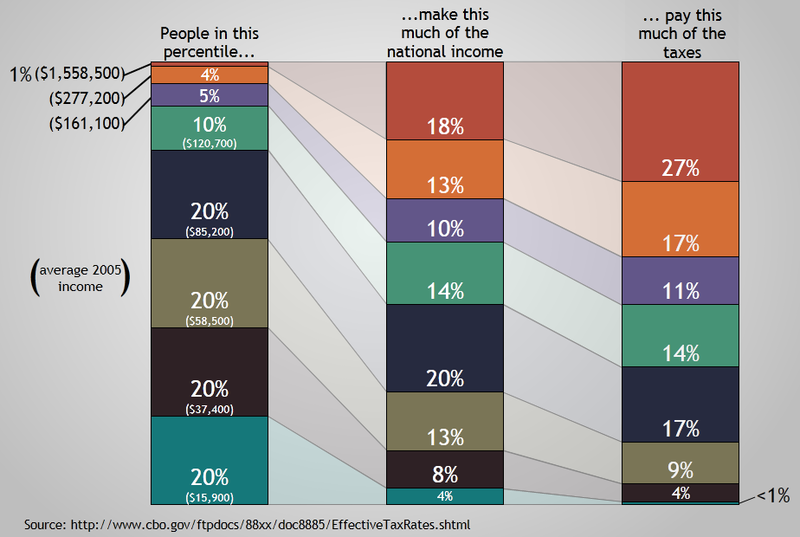 [*y8qm57z, 3dza8v6] It is generally accepted that the first 95% of tax filers comprise the poor and the middle class. Anyone in the top 5% is considered the ‘evil rich’. If we look at the share of all federal taxes paid by the poor and the middle class in 1983, the beginning of Reagan’s tax cuts, we find their share was 62.7%. Naturally the share for the ‘evil rich’ was 37.3% (100% – 62.7% = 37.3%). Now let’s move to the last year of Reagan’s second administration. In 1988 the poor and the middle class share of all federal taxes paid had gone down to 54.4%, while the share paid by the ‘evil rich’ went up to 45.6% (100% – 54.4% = 45.6%). We can see that the rich ended up paying a larger share of federal income taxes while the poor and the middle class paid less. Our first 800 pound gorilla. In 1997 the poor and the middle class share of federal taxes was 48.1% while the ‘evil rich’ share was 51.9% (100% – 48.1% = 51.9%). By the year 2000 the poor and the middle class share of federal taxes went down again (43.5%), and the ‘evil rich’ share went up again (56.5%). The Contract tax cuts are our second 800 pound gorilla. How is your faith in that groupthink liberalism doing that tax cuts take money from the poor and the middle class and give it to the rich, American neighbor? So, did George Bush’s tax cuts benefit the ‘evil rich’ at the expense of the poor? According to liberals everybody knows that! Nancy Pelosi, Dennis Kucinich, Jimmy Carter, John Kerry, Barack Obama and virtually every liberal knows that! Well whoops again, American neighbor. In 2003 when the full Bush tax cuts were instituted, the poor and the middle class share of federal taxes was 45.6% while the ‘evil rich’ share was 54.4%, but in four years the ‘evil rich’ share had gone up again to 60.6% while the poor and the middle class share of federal taxes went down again to 39.4%. Three 800 pound gorillas in a row. Examining the Gini Coefficient which measures income distribution over time, we find that the Gini Ratio for individual income has not changed since 1994. [*66u974y] Other measures of the Gini Coefficient for the U.S. may find a slight rise in this time period by comparing household income instead of individual income, which does not as accurately tell the story, because in rich families one spouse is likely to be the breadwinner much more so than in poorer families. Comparing to other countries is also a game of relative comparisons. For instance, the U.S. has Food Stamps. Other countries do not, but this important distinction cannot be accounted for in a Gini calculation. Neither can the large population of illegal immigrants and higher incarceration rates which deceptively skew the data toward inequality, and are not an occurrence in most countries usually compared with the U.S.
What the Gini graph illustrates is that while the super rich share of measured wealth increases, the poor’s share has risen in relative terms just as much. Not illustrated is that the unmeasured wealth through provided government services, programs and infrastructure, along with the receiving of income through wealth redistribution are also increasing. So in fact, poor Americans are likely better off in relative terms than are the rich since 1994. Also, the claim by liberals that the top 1% possess a higher percentage of America’s wealth today than since the 1920s is simply not true. As can be seen here, [*776y5uk, 3yek995] the portion of wealth possessed by the top 1% has continuously trended down from the 1920s to 2000. This study is based on estate tax returns which taxes wealth at the time of death, and so provides an accurate and objective measure of individual private wealth over the decades. The above noted individual income Gini Coefficient completely agrees with this study for the period from 1994 to 2000, and confirms that there has been no change since 2000. The facts do not support the liberal contention that wealth has been increasingly concentrated within the top 1% of the population – another noble lie. When all types of wealth are considered, it is the poor that have by far benefited the most since the 1920s. One other thing, American neighbor. Another liberal mantra is that “the rich don’t pay their fair share” (again, more paranoia). Liberals want the tax system to be more progressive where the rich pay a significantly higher rate of taxes than the middle class and the poor. Well, this has been the case for almost one hundred years. In fact, even including the Bush tax cuts, America has the most progressive tax system in the world as seen in this 800 pound gorilla: [*2d6dpvt, 756n28e] In other words, the American rich already pay more in proportion to their earnings than the rich in all other countries of the top 24 economies in the world, so I guess liberals are right in a convoluted sort of way. The ‘evil rich’ don’t pay their fair share – they pay more than their fair share, if you compare them to the rich of other successful economies. In fact, the OECD study found that the top 10% of American taxpayers paid 23% more by proportion than the top 10% of taxpayers of the next highest country which was France. Whoa! That’s quite a bit more than their fair share, don’t you think, American neighbor? How are you doing with resisting your scoff reflex, American neighbor? Are you still with me? Are you still channeling your inner Mr. Spock? Were you able to stay focused throughout each of the lessons so far? If not, go back and reread what you scoffed over, read the asterisked links. Put your self-interest first and put away your emotions and concentrate. This is the only way for you to overcome your liberal groupthink conditioning. Any resistance you might feel is your groupthink conditioning attempting to protect itself. It doesn’t want you to expose yourself to critical examination of programmed groupthink liberalisms, because contextual investigation and critical analysis combined with self-interest are always groupthink’s lethal enemies. As a liberal, how did you originally reach your conclusions about the various issues addressed so far, American neighbor. Did you search them out. Did you research both sides of each issue. Let’s be honest, American neighbor. As a liberal it is very unlikely that you researched both sides. If you were an aggressive groupthinker (alpha liberal) it is a virtual certainty that you did not. Admit it, American neighbor, you just accepted what other liberals told you to believe – you were sucked in by liberalisms. You just accepted the noble lie that the two unequal lines that they told you were equal, were equal. And when your beliefs have been challenged, how did you respond? Well, how else could you respond? With sophistry and demagoguery, or silence. Of course as a passive groupthinker (beta liberal) you may have backed down and held your tongue, but if you did respond your only recourse would have been this principle of liberal attitude: For the contemporary liberal groupthinker, sophistry and demagoguery are the weapons of choice against critical thinking. Do you know who the ‘evil rich’ 10% are who steal money from the poor, American neighbor? You probably know some. There may be some in your family. You may even be one. The top 10% includes anyone who earns over about $110,000 per year before taxes. Did you know that means every liberal politician in Washington is one of the ‘evil rich’? Nancy Pelosi and Jimmy Carter who I quoted earlier are very definitely part of the ‘evil rich’ crowd. President Obama has made millions from his book sales over the last few years, so he too is one of the ‘evil rich’. But of course, they are liberals, their motives are noble, and ‘they care’. Well how much do you think they care, American neighbor? Do you think they cared enough to give back their portions of the tax breaks they received from the tax cuts of Ronald Reagan, the Contract With America, and George W. Bush? After all, they claim it is ill-gotten bootie. They claim the ‘evil rich’ – them – benefited from the poor with these tax cuts. They believe this with a passion! That is their justification for raising taxes on the rich, but that means that they too supposedly ended up with dirty money stolen from poor people. Nancy Pelosi said her share came from “food out of the mouths of children” for gawd’s sake! What do you think that they did with those supposedly stolen tax cuts, American neighbor? Do you think that they couldn’t sleep at night? Do you think that they anguished over it? Do you think that they gave the supposedly stolen money back? Nope. They kept it like thieves. Not one of them gave the money back, American neighbor. If any of them ever had it would have been huge news! Imagine if President Obama decided that his share of the tax breaks under Bush that he benefited from was so dirty that he was going to give it back to the treasury, or if he decided to donate it to some charity. Imagine if Nancy Pelosi gave her share back as “food” for the “mouths of children”. Do you think this would not be widely reported as illustrating how liberals care for the poor (and how it proves that the money was stolen on their behalf from the poor)? Of course it would. But have there ever been any stories like this in the media? Nope again, American neighbor. There is certainly more than enough evidence to conclude that Google is a very liberal corporation top to bottom and objective to outcome (and in a cozy liberal relationship with America’s liberal government administration). One would think that Google would not have any problem whatsoever “paying their fair share of taxes” as every liberal would expect of a noble liberal company, but as I said above, think again, American neighbor. Google thinks “fair” is when they get to profit from invading your privacy, not when they pay their taxes. They will use every loophole in the book to avoid “paying their fair share,” currently to the tune of sixty billion dollars! [*32jypx7] (In #13 Government Healthcare – One Giant Death Panel, we’ll look at those other gougers according to liberals – the health insurance industry. You know, the industry that is ruining healthcare in America because they’re bleeding it dry. [/sarcasm] The whole industry made $8B in profits for 2008 while Google is hiding $60B from being taxed. Who’s your villain now, American neighbor?) Google’s corporate philosophy is supposed to be summed up in this simple statement: “Don’t be evil.” According to liberal standards it doesn’t look like they’re living up to their own motto, does it, American neighbor? So, here is your supposed corporate cabal, American neighbor. If there was ever a case of this liberal fantasy corporate fascism, it is liberal companies like these that are the ones in control! The column goes on to point out that the overall tax rate for dividends in America is actually the fourth highest of the 34 OECD countries. And it turns out that Buffett’s receptionist earns a heck of a lot more than the average receptionist. It seems she is a one percenter herself! [*7mdn4fw] The real con is the implication never actually mouthed by Buffett and President Obama who endorses his idea, that somehow the rich are paying less income taxes than those with much lower income, so naturally marginal income tax rates for the rich need to be drastically raised to “redistribute the wealth”. Here is the con: Although he makes billions, Warren Buffett only pays himself a salary of one hundred thousand dollars per year. So if we do as Obama suggests and substantially raise marginal income tax rates, Warren Bufffett won’t pay a dime more in income taxes. Clever huh? The bulk of his earnings are taxed as dividends and capital gains – nice dodge, Warren. But even if this rate is increased it will not make up for the equivalent income tax he doesn’t pay. And guess what that increased rate would do for his Berkshire Hathaway stock if dividends were included in the tax? Well conveniently, it will drive investors to it, because it does not pay dividends, but reinvests the dividends it receives from its investments, thus offering a less taxed alternative for those looking to avoid paying the tax increase – more cleverness. Republican Mitt Romney has been chastised for admitting to paying only 15% federal taxes (not included is the double taxation and state taxation). But as we see here [7ahelfw], only 3% of tax filers even pay that – a full 97% pay less (no doubt, including Mitt Romney’s receptionist). Really, all Warren Buffett is saying is that, “I’ve already made my billions and my currently existing wealth won’t be taxed any differently. Increasing income tax rates, capital gains tax rates or corporate tax rates will only minimally affect me now, I don’t have many years left to live, and I want to be seen as this great guy who really cares – so to hell with the economy, and to hell with the rest of you who also would like to be comfortable someday!” This isn’t the first time he has pulled this stunt. In 2007 he suggested a 100% tax on stock market trades of less than one year that would not affect his buy and hold strategy at all, but would likely drive more dollars to his conglomerate. He also supports the estate tax, claiming that it avoids the development of a plutocracy, but forgot to mention that his insurance business greatly profits from policies geared toward dealing with the estate tax. In effect Buffett’s selfish attitude is no different than Michael Moore’s in our above MCTE where now that he has made his tens of millions of dollars from the marketplace, he’d be happy with shutting those same opportunities down for everyone else. And isn’t it convenient that Obama’s denial of the Keystone XL pipeline to import oil from Alberta directly profits BFF Warren Buffett’s railway. Then there is the tidy little sum of 154 million dollars that Warren can use as pocket change from the Obama 25 billion dollar vote buying scheme foreclosure settlement – all just more you-scratch-my-back-and-I’ll-scratch-yours. [*6quef4l, *85cwx4f] If Buffett is really desiring to pay more taxes, maybe he could start by paying the taxes he already owes. [rolls eyes] [*3hqmznm] Maybe Obama could get his other friend and fundraiser to pay some taxes too. [*c7un4zj] It seems the real tax message from this Warren Buffett story is that the tax system needs a huge overhaul and simplification, American neighbor, and to beware of billionaires offering up other people to pay more in taxes. • Have rich liberals paid back their stolen tax cuts? • Are liberal leaders more compassionate than conservative leaders? It’s not like liberals exactly value nonprofit donations anyway. According to the NY Times the Democrats think there are too many charity groups that are “skillfully exploiting the tax code” and “last year cost the federal government more than $50 billion in lost tax revenue.” [ybfcnts] This is what happens when liberalism addles your brain, American neighbor. You start thinking of charity groups as ‘exploitive’ competition that deprive the government of tax revenues (paranoid much? ), but even if there are a few nonprofit groups that are illegally taking advantage of the tax system, it is legitimate tax payers who are the victims, not the government for heaven’s sake!?! Imagine if all liberals were as honest and concerned as they claim to be, American neighbor. If they actually possessed cognitive dissonance their consciences would not have allowed them to keep those supposedly stolen tax cuts that they have received over the last thirty years. Imagine if liberals actually believed in the sophistry they use to demagogue conservatives about supposedly stolen tax cut money. Imagine if liberals were truly compassionate for the needy and the poor. Liberalism rejected Dewey’s universal principle of there being no right and wrong, and turned it into an exception for liberalism that says liberalism is always right. This relates to the liberal principle: A contemporary liberal’s honorable motives and noble fight against contemporary conservatism excuses all liberal failures and indiscretions. In fact, liberalism is so right that any opposition must be demonized to illustrate how wrong that opposition is (remember, to a liberal, opposition in of itself must be motivated by evil, which of course stems from their compulsive paranoid delusion – known here as progressive-fascism). Even using the poor as a demagogic weapon while by their own reasoning knowingly stealing from them is not out of bounds. This truly is a definition of self-righteousness – and liberalism. And don’t think it is only the rich who supposedly stole money from the poor. So did the middle class, apparently. For instance under the Bush tax cuts those making $25,500 to $41,640 received 9.4% of the tax cuts, those who made $41,641 to $68,295 received 17.5% of the tax cuts, and those who made $68,296 to $97,685 received 15.5% of the tax cuts. Don’t think you didn’t pocket some supposedly stolen tax cut money just because you have a middle class income, American neighbor. You are guilty too. [4farst] In fact, this will be a good gauge of where you currently stand in your programmed liberalism, American neighbor. Guilt and shame usually follow a person to bed. If you find tonight that your conscience has a hard time allowing you to sleep, this would be a good sign of an awakening of your cognitive dissonance. Of course, if you are not troubled by your conscience it could be because you have already accepted that the idea of tax cuts being stolen from the poor is nothing more than irrational liberal demagoguery and compulsive paranoia, and that would be an even better sign – a rejection of liberalism through critical thinking. However, if a liberal can read all of this and still scoff it off, they may actually be in need of direct psychoanalytical and pharmaceutical help. But really, American neighbor, who is the genuine Dr. McCoy? Is it conservatives that are the selfish and greedy ones when they cut taxes that demonstrably benefit the poor, and reform welfare so that it provides millions of welfare recipients with jobs, and are much more generous in donating their time, money and blood than liberals? Or aren’t liberals the actual selfish and greedy ones, proclaiming that they ‘care’ so much more for the poor, while being the richer of the two ideologies, but giving so much less than conservatives, to mainly charities that benefit the elite, and all along this meager liberal giving is as they themselves charge, after they have stolen it from the poor in the first place. Indeed, the words selfish and greedy hardly seem pejorative enough terms to describe liberals. Perhaps other words might be more apropos like hypocrites, avaricious, fakes, covetous, charlatans, tight-fisted, thieves, Scrooges, rapacious, swindlers, cheats, swines (I like that one), predators, frauds, prehensile, phonies, grasping, crooks, con artists, fascists… I’m sure you get the picture. You do realize, American neighbor, that conservatives will now read this essay and challenge every liberal they know and meet: “Have you paid back your stolen tax cuts yet?” When liberals object, the next question will be: “If tax cuts are not stolen from the poor, what legitimate right does the government have to tax more than an equal amount from everyone, regardless of income level?” Because the answer is “none”, look for a flurry of demagoguery and sophistry in response, American neighbor. There simply is no way to rationalize a way out of this conundrum. Either liberals must believe that tax cuts for the rich are stolen from the poor, or their claim to tax the rich more has no legitimacy. But if they cling to this rationalization of tax cuts for the rich supposedly stealing from the poor, they make themselves (the liberal rich) out to be knowing thieves for not paying the stolen money back. • Michael Moore ranted against profits from capitalism as “evil” only after his own experience with free market capitalism made him financially secure, but has not given back the “evil” profits he made from capitalism. (Oh – and also what about those stolen tax cuts Michael?) Was he playing stupid or just not playing? • Liberals claim that tax cuts are immoral and stolen from the poor to be given to the rich, but it is rich liberals including all congressional liberals and the liberal President and Vice President that refuse to live up to their claim and instead like thieves keep their supposedly stolen tax cuts. • Exactly opposite of liberal assertions, the tax burden has consistently shifted away from the poor onto the rich since the early eighties with no exceptions for periods of tax reductions. • The universal liberal sophistry that the rich keep getting richer and the poor keep getting poorer is not supported by IRS records or the Social Security Administration numbers on wage distribution. • The American rich actually pay more than their fair share of taxes compared to the next 23 leading economies of the world. • Liberals prefer to be generous with other people’s money, conservatives with their own. • Raising the top marginal tax rate can actually lead to less government tax revenues due to a reduced productivity of those affected by the upper tax bracket increase (also see Revenue Growth Rates in #8 The Not So Surprising History of Tax Cuts). • Liberals imagine themselves as more compassionate than conservatives, but their actions do not match their imagination. • Liberals demagogue conservatives as the richest, domineering CEO types in America, but it is liberals who are mostly the popular, richest, domineering CEO types in America. • Liberals demagogue Republicans as the “party of the rich”, but the numbers illustrate that the Democratic Party is the party of the rich and super rich. You know, American neighbor – the ones with all of that stolen tax cut money. • Liberals mostly give to elite, artsy charities while conservatives mostly give to charities that serve those in need. • It is not conservatives who are less giving for the needs of others less fortunate. It is liberals who are less giving for the needs of others less fortunate. • Conservatives donate more time as volunteers and give more blood than do liberals. • Conservative evangelical churches provide more ministries to the needy than do liberal mainline churches. • Red states are ranked high on the generosity index, whereas blue states rank low. • Small government Tea Partiers are much more generous than big government liberals. • The more government intrudes into the charity business the less the resulting amount of net recourses that are available for those in need. • Liberals are more likely to steal excess change. • Liberals who buy ‘green’ are more likely to smugly lie, cheat and steal. • The liberal myth that liberals are more giving than conservatives in reality is consistently proved to be the reverse by actual data. Liberals are irrationally paranoid about the rich in America supposedly stealing from the poor: Compulsive paranoia is the foundation of contemporary liberalism. It is now obvious to you, American neighbor, that the liberal ingrained disdain for the ‘evil rich’ is not based on reality, but is an external attitude deposited into the liberal’s thought process from the outside. Ditto for the belief that liberals are much more caring than are conservatives: Contemporary liberalism is a type of societal conditioning. This essay is also a huge lesson on the double standards principle: Without irrational double standards contemporary liberalism cannot exist. And the rationalization principle: For contemporary liberals superficial rationalization is always the first and final element in their ideological line of thought. Imagine if liberals actually had to live up to the rhetoric they demagogue conservatives with. Do you think ever in a million years that Michael Moore would donate all of his “evil” capitalist earnings to the poor in order to cleanse his anguished conscience?!? Is the moon made of blue cheese, American neighbor? How then can he live with himself? Shouldn’t rich liberals be the most self-hating people in the world? If being rich is so evil as liberalism defines it, shouldn’t a liberal being rich, profiting from the evil free marketplace, and accepting those evil stolen tax cuts, turn them into most pathetic of characters? Well there is always the noble liberal motives principle: A contemporary liberal’s honorable motives and noble fight against contemporary conservatism excuses all liberal failures and indiscretions. And then there is the scoff principle: Contemporary liberalism relies on a programmed, instinct-like scoff reflex to preserve itself from the consequences of critical thinking. Those should help Michael sleep at night (poor dear…). The above dozens of quotes from leading liberals/Democrats about tax cuts supposedly stealing from the poor are also wonderful examples of the liberal projection principle: Contemporary liberals project what they subconsciously loathe about themselves as demagoguery toward their opponents and society as a whole. Liberals see themselves as compassionate for the poor, but their wealth doesn’t jive with that so much, so instead of sharing their wealth they loathe it and project their spite onto conservatives (and keep the supposedly stolen money). It is really only a matter of the fascist projecting his fascism on others. If only all of life’s problems could be solved so easily. [/sarcasm] But really, American neighbor, this essay is a prime example of the principles: The essence of contemporary liberalism is that the individual is blameless and society is always guilty. Contemporary liberalism is absurd. Above we have twenty conclusions about liberalism that illustrate what an utter and complete sham it is. Everything liberals think about themselves in regard to money and compassion amounts to one big pile of stinking bull bleep! But the most incredible part is that liberals don’t actually play stupid about these things – they have actually talked themselves into believing all of this liberals-are-compassionate and the-rich-are-evil nonsense, so they aren’t actually playing. • Will you pledge to never be rich? I have a few questions for you, American neighbor. Are you rich? Does your household bring in more than $68,000 per year? Are you aspiring to earn more than $68,000 per year? Do you buy lottery tickets hoping to win millions of dollars? Do you gamble hoping to make it rich? Do you make investments hoping to cash in for a life of luxury? Have you started a small business hoping it will expand into a large business, and large income? Are you hoping your career will be financially successful? Are you hoping to write a best-selling book, produce a hit single, make it big as an artist, rise in professional sports? Do you know why I picked $68,000 per year, American neighbor? Because that is the mean income in America for 2010. It is what a “fair” income is in America. And liberals are all about being “fair”. If you take all household income in America and divide it by the number of households you get $68,000 per household, so if you make more than that you are in the unfair minority category of the ‘evil rich’. I have another question for you, American neighbor. If you as a liberal hate the supposed inequality of rich versus poor so much (after all – it’s so unfair! ), will you take a pledge to NEVER be ‘rich’? If your household ever grosses more than $68,000 per year (or whatever the mean income is in the future) you hereby pledge in your own blood, on your ancestor’s graves, in the witness of all the dead who may or may not be watching, in the sight and hearing of all gods, real and unreal, that if you don’t give every penny of the excess away to the poor (after all – it’s only “fair”! ), without claiming a tax break on any of it, may you be cursed to life of misery and an eternity of hell. No? You don’t want to make that pledge? You actually wouldn’t mind living with a bit of luxury only those with money can afford? Welcome to the unfair attitude of the ‘evil rich’, American neighbor. Do you have any cognitive dissonance here, American neighbor? Are you feeling even a little tug of guilt or shame? How will you answer the “Have you paid the money back…” question? Will it be with a scoffing upraised finger and “f-you!” of a typical Michael Moore type liberal fed up with having their utter hypocrisy exposed? Which side of this question would you rather be on, American neighbor? Would you rather be on the side being asked, or on the side doing the asking? Now that you know that all of this mush about liberal compassion is nothing but a facade, if you can now analyze yourself with your Mr. Spock attitude of third person analysis, where would your self-interest be better placed? Wakey, wakey, American neighbor. Liberals are actually only generous with other people’s money – like a charlatan they just project compassion as their own. So if you yourself actually are a personally caring and giving person, American neighbor, (or truly want to be), this is just more evidence that at your core you are not a liberal. Sleep well tonight, American neighbor, and then get up tomorrow with a renewed attitude toward compassion. Or here: [ybgbfov] Total contributions for 2009 were expected to be about 3.1 million dollars. [yl85umt] But now that I have gotten the word out to liberals 2012 should be a banner year measured in trillions of dollars (because liberals REALLY CARE!). Perhaps President Obama could kick it all off with a special presidential address to Congress and the nation from the House, where he and all liberal members of Congress could write out their own checks right there on primetime TV with the whole country watching. Talk about “redistributing the wealth!” Imagine, American neighbor, I could have single-handedly solved America’s debt problem overnight!